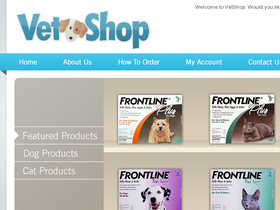 Vet Shop, online at vetshop.com is your best resource for over-the-counter medication for your pets. Vet Shop is owned and operated by pet lovers dedicated to bringing you the best online pet store with the lowest prices. They diligently seek suppliers that offer great deals to be able to offer customers incredible savings on pet medicines without compromising on product quality. VetShop.com recognizes the importance of your pet companion and strives to enhance their lifestyle by offering quality and safe over-the-counter medication. You'll find top brands like Frontline, Advantage, and more. Plus Vet Shop offers free shipping within US. Enjoy best savings on your next Vet Shop purchase with coupons, promotions and discounts found here on 58coupons.com. Shop at Vet Shop today and enjoy free shipping on all orders. Click link to get started. Save 10% on your next order from Vet Shop when you use this code at checkout. No minimum required! Click link and shop today. Buy Frontline Plus at Vet Shop for as low as $25. Plus enjoy their best price guarantee and free shipping. Follow this link to get started. Vet Shop sells high quality catnip starting for only $7. Click link to view.